A lot of times they’ll go through several iterations of massive success with this, then write some books, found a consulting company, go on the speaking circuit, and so on. And almost always, they seem to demand rigid adherence to specific sacred-cow principles that must remain inviolate. You should be really skeptical of anything that smells like this. Sacred cows make the best steaks, and here’s why. No, not the mugs, the mugs aren’t why you should be skeptical. But let’s talk about how this usually plays out by looking at a couple of places I’ve seen adamant insistence on the one true gospel. I’ll use real examples from some things I’m currently working on in my business right now. Aaron Ross has a bestselling book called Predictable Revenue in which he declares the death and obsolescence of salespeople making cold calls. I define a cold call as “calling someone who doesn’t know you and isn’t expecting your call.” (page 24). Aaron espouses Cold Calling 2.0, which is a different method of prospecting for sales: “prospecting into cold accounts without ever making any cold calls.” (page 24). He returns to this point again and again through the book: never, ever make any cold calls. Ever again. Ever. Aaron claims that this worked incredibly well and is the way the entire SalesForce team was trained and scaled. I don’t doubt that they use Cold Calling 2.0 at SalesForce. But my experience with SalesForce as a CEO/founder of a tech company does not match with what Aaron says they did. After we closed our first round of funding, my cofounder and I were spammed with cold calls from SalesForce. There is no other way to put it. They badgered us mercilessly. Mercilessly. Aaron talks about sales development reps being “pleasantly persistent.” I am not proud to say I eventually yelled obscenities into the phone at the sales rep who would not take no for an answer. As a rule I do not curse at people and it is very rare for me to lose my cool, maybe only happens once every couple of years. He cold called me and would not stop calling back every few days even after I, the CEO of the company, had asked him to stop and told him the answer was no at least several times. Not only that but he called my cofounder as well. And emailed both of us. It was infuriating. No means no! This was a while ago and I am sure my memory has become inaccurate. I bet they have records, though, of every interaction. I would be happy to hear that I’m remembering this wrong. SalesForce, if you’d like to correct me, please look up Zach E’s interactions with me and let me know if I’m misinterpreting. HubSpot’s methodology is inbound marketing. The idea is that you attract people and companies to you by providing them with helpful, relevant content. Blogs, webinars, etc. Really valuable stuff. By doing this, you help them be successful with or without you, but you also ask them to identify themselves (two-way street). You make people aware that in addition to all the stuff they can do on their own with the free content and resources you provide, you also provide services/products/whatever that will amplify their success. So in HubSpot’s case, for example, their blog helps people understand how to do marketing that turns strangers into ravingly happy customers. Not just customers—promoters, who can’t stop themselves from saying how awesome your product or service is. And thus, by doing this “marketing that people will love,” you make everyone aware of your products/services and how valuable they are, and magnetically attract customers to yourself. You turn a “pushy” outbound sales/marketing process into a “magnetic pull” of inbound attraction. And HubSpot also strongly condemns cold-calling, pushy sales tactics… they recommend permission-based marketing instead. They talk about the very real dangers of legal repercussions, domain blacklisting and spam database scoring, and so on. Spammed. Mercilessly spammed. Katie C emailed me. She sent me LinkedIn requests and messages. She tweeted to me. I can’t remember if she called me. I think she did. I know for sure that she found and pushed messages to every possible channel you could reach me by. Well, probably not text messages, come to think of it. But this went on, and on, and on. I did not respond; I decided to try silence instead of “no,” because I’d been spammed out of my mind by people who wouldn’t take “no” for an answer. After Katie C eventually stopped (after sending an increasingly ridiculous, over-the-top series of “breakup” messages, sobbing about how I didn’t love her anymore), I finally got some peace for a while. Then Andrew F started up. I’d had enough and I reported it to SalesForce’s abuse department, because they were sending these non-compliant emails from SalesForce. Here’s the thing. At VividCortex we are customers of both companies. I recognize the value of what they provide, and I knew about their offerings. Before I even founded the company I knew we’d use SalesForce. We used Act-On for marketing automation for a while, but recently switched (the reasons why are another interesting story) to HubSpot. We aren’t customers because of their obnoxious tactics, but despite them. If Cold Calling 2.0 and Inbound Marketing are the bees’ knees, and create incredible results, and are sacred cows you should absolutely adhere to, then why do these two extremely valuable service providers not follow their own advice? Because one size doesn’t fit all. Cold calling does work for some people (generally not for me, though there are exceptions). Finding a CEO/founder’s contact information after a funding round, and pestering the hell out of him/her about lead generation on every possible social network and communications channel, does work in some cases. These companies are not satisfied with the results they can obtain from following a simple process to the letter. They know they can eke out incremental improvements by crossing the line into the “off-limits” areas. That’s why you should be skeptical of anyone’s magic secret sauce. The more they insist there is a bedrock principle (or three) that you must absolutely believe in, no shades of gray—the more you should be skeptical. Going through the sales process with HubSpot, in particular, was like the twilight zone. Their sales team was making it sound like HubSpot itself generates all of their revenue completely from inbound marketing. The hypocrisy makes it hard to believe anything they say. Everything becomes too good to be true. It’s really weird, because there’s cognitive dissonance everywhere. What do I mean by that? It’s pretty simple—I know and I believe in the value of inbound marketing. It works. I’ve not only seen it done, but I’ve done it myself, and the results were incredible. At a previous employer, you practically could not do a Google search for a related keyword without my content appearing in the first page of results, and usually the first several links. When we hooked that up to a marketing automation system, all the numbers went through the roof. It worked at that company, and it’s working shockingly well at VividCortex too. That’s why I knew I needed inbound marketing and marketing automation. I knew I needed Marketo, Act-On, HubSpot, or another vendor. I didn’t know which one I wanted to use—I’d used Marketo before and wanted to see if I could find something a little better—but I knew one of these kinds of companies would be absolutely vital. So when HubSpot was telling us how insanely good the results would be from doing “pure” inbound marketing, and I knew that they were simultaneously telling the truth and also did not adhere to that advice themselves, I had to get off the phone with them and talk with the team about what we’d just heard. What was real and what was hype? This is a vitally important exercise anytime someone shows you a method/process/practice that’s the one true way. This holds for things I write and say, too. I say disciplined database performance optimization depends on measuring the workload the systems handle, and without it you’re just doing trial-and-error. I say a low-sugar, high-fat, minimally-processed diet can transform your body. I say a lot of things to try to teach and explain what I’ve discovered to work well. But if you ever catch me insisting there are no exceptions, call me out on it. Sometimes cache hit ratios work to tune databases. Sometimes I like to eat ice cream. Life’s not supposed to be black and white. Sacred cows make the best steaks. Mugs by André Freitas. 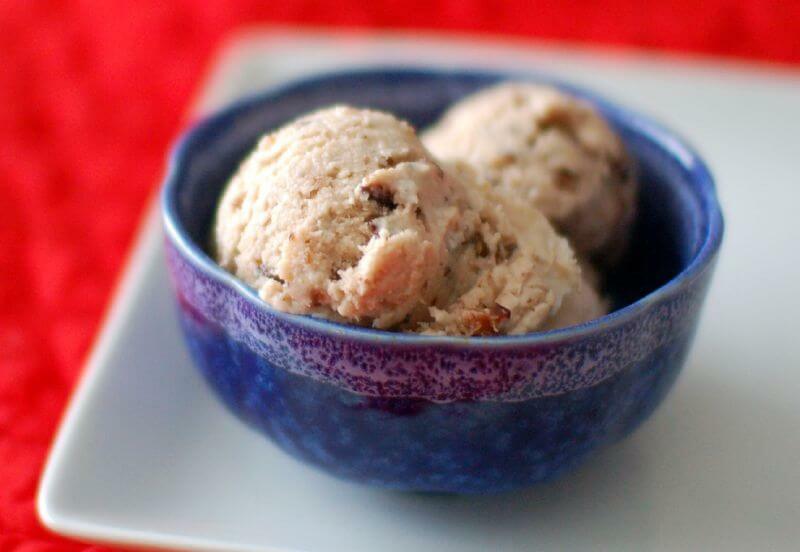 Ice cream by ulterior epicure.